Home Care in Youngsville NC: Why Do Seniors Get Restless Leg Syndrome? Why Do Seniors Get Restless Leg Syndrome? If your aging relative has difficulty sleeping at night, you may want to ask them how their legs feel at night. 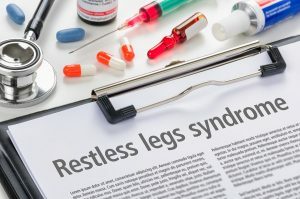 Restless leg syndrome (RLS) is a common condition that cause a feeling in the legs like they have to move. Because it often occurs at night, it can interfere with sleep, either causing them to wake up or be unable to fall asleep. Understanding more about the condition and what causes it may help you to manage it in your aging relative. An uncontrollable feeling of needing to move the legs that usually starts when the person has been sitting or lying down for a while. Sensations that are relieved by moving, such as by walking, stretching, or wiggling the legs. Legs may twitch or move during sleep. Your aging relative may describe the feeling using different words, but usually people with RLS don’t describe the feeling as cramping or feeling numb. However, they do always say they feel the need to move their legs. Some medications, including antihistamines and antidepressants. Sitting or lying still for too long. Being either too hot or too cold. Some people are affected by heat and others by cold. If your aging relative has RLS, home care can help them to relieve the symptoms so they can get a good night’s sleep. Home care providers can massage the senior’s legs or apply hot or cold packs to ease the sensations. Home care providers can also increase the amount of exercise the older adult gets by going for walks with them or getting them involved in physical activities around the house. IF YOU OR AN AGING LOVED-ONE ARE CONSIDERING HOME CARE IN YOUNGSVILLE, NC, PLEASE CONTACT THE CARING STAFF AT SENIORS HELPING SENIORS TODAY. CALL (919) 761-5346.